Ballynahinch, the jewel in the crown of Connemara encompasses late 20th century comforts in a setting untouched by time. 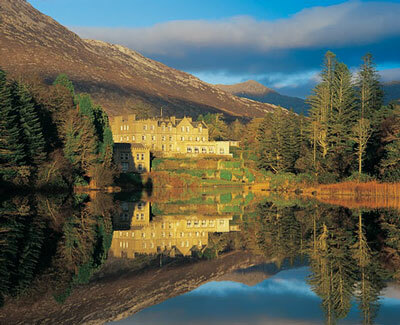 The tradition of hospitality at Ballynahinch Castle has long and strong foundations. The manor castle dates from the 18th century, upgraded in recent times to meet the needs of today's informal but discerning cleintele. Beautiful rooms, including the luxury Riverside wing are tastefully and individually furnished. Many have special features such as 4 poster beds, walk through wardrobes and all enjoy excellent views of the river, mountains or both. In casual country elegance, a superb restaurant, fed by fresh home produce and locally caught fish is complimented by an attractive old world bar and open log fires. With 455 acres of exceptionally beautiful wooded grounds and walks, fishing rights on out own salmon river and lakes, 13,000 acres of prime woodcock shoot, tennis and cycling, the castle offers all the attractions of a large private estate. A championship golf course, sea fishing and horse riding are all within easy reach. Ballynahinch, the jewel in the crown of Connemara encompasses late 20th century comforts in a setting untouched by time.